Poultice Creosote Remover is a revolutionary product designed to completely remove stage 3 creosote from flue tiles, smoke chambers, and fireplaces. When PCR is applied, it dissolves the creosote and absorbs it. As it absorbs the creosote and dries, it loses its adhesive properties and and falls off the sides of the flue tiles. Any remaining PCR can then be removed by chimney sweeping. PCR can be applied by brush in areas that are easily accessible or with a specially designed tool that can be pulled up through the chimney flue by a winch. To remove glazed creosote in smoke chambers, PCR can be applied with a smoke chamber sprayer. PCR should be used where glazed creosote is present in order to reduce the risk of chimney fires. 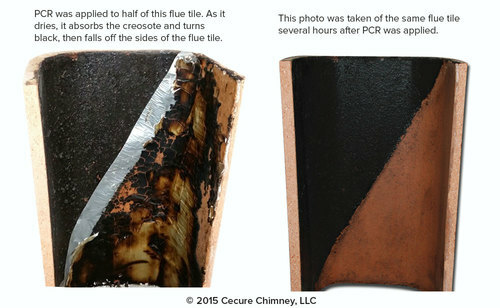 It is not uncommon for a PCR clean to reveal cracks or defects in the clay flue tiles that were not visible before the PCR cleaning. A PCR cleaning is only recommended if the user plans to avoid a repeat situation. PCR cleaning is significantly more than a regular cleaning and is not something that one would want to have done yearly or even every few years. 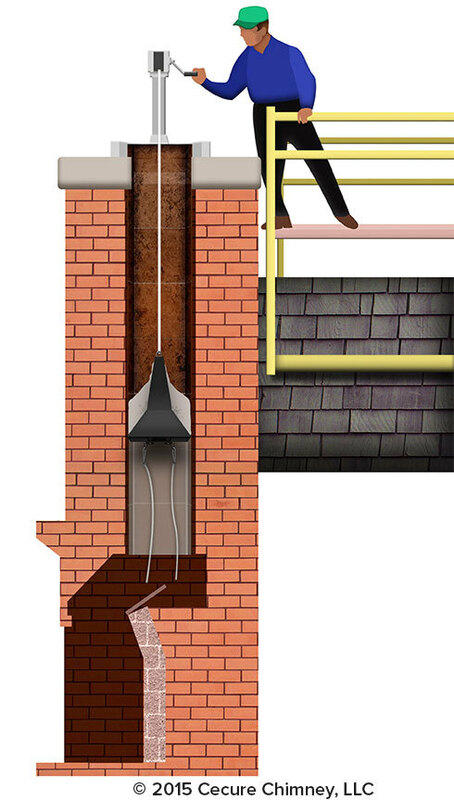 If stage 3 creosote is present in a chimney, burning habits need to be adjusted. In most cases 3rd degree creosote is formed by repetative smoldering fires which inhibit complete combustion. There are other causes such as burning unseasoned firewood or trash. Certain chimney conditions can also help contribute to stage 3 creosote. Oversized flues, improper construction, and poor draft will also increase the amount of time the smoke spends in the chimney (known in the chimney industry as residence time) which contributes to excess creosote. You may be wondering, "What is stage 3 creosote"? First, creosote is a natural by-product of burning wood. It can be defined as a combustible or flammable deposit that originates as condensed wood smoke. It consists mostly of tar, but also includes vapors and other organic compounds. Creosote can take multiple forms and usually falls into one of three stages or degrees. Stage 1 Creosote consists of sooty, ash like deposits and can easily be cleaned with a brush. It is less combustible than other types of creosote but should still be removed to prevent flue blockages, moisture retention, chimney deterioration, and unpleasant odors. First degree, or stage 1 creosote developes when there is reletively complete combustion of the wood and relatively high flue gas temperatures. Stage 2 Creosote is usually in the form of shiny, dry, hard, black flakes. Stage 2 creosote is more difficult to remove than stage 1 creosote but can still be cleaned using a brush and sometimes requires additional scraping or other measures to remove. It is more dense and flammable than stage 1 creosote even though it has been heated and pyrolyzed. Stage 2 creosote should be removed immediately since the ignition can cause a significant chimney fire. Stage 3 Creosote appears as dense, hard, shiny black deposits and is a form of tar glaze that has been baked onto the chimney walls. These deposits retain a high energy content because most of the flame-producing hydrocarbons are still present. Although it can be difficult to ignite, once ignition occurs, it burns with great intensity and extreme heat, making it extremely dangerous. 3rd degree creosote cannot be removed with a brush or by scraping. More aggressive cleaning methods often result in damaged tiles and should be avoided. The solution is either to remove the flue tiles and replace them with a stainless steel (usually double walled and insulated) liner or a chemical clean (PCR). PCR, as described above is applied, allowed to remain in the flue for a few days, and then cleaned using a brush. In some cases, damage such as cracks in the flue tile become visible after PCR is brushed away. These cases require further measures.